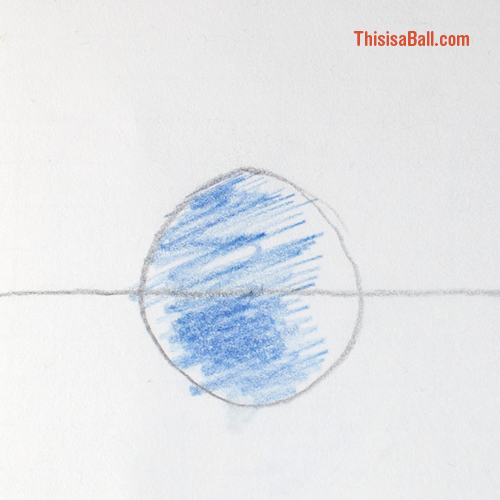 When I had been visualizing this film I pictured the ball as red. Maybe that’s because I have red hair and I saw myself as the ball? Basketballs are orange. The rubber dodgeballs we used in elementary school were red too. So, it was definitely going to be a red ball. But, at the last second I switched my mind and used a blue pencil. I had written the ball to be a boy. So, using blue helped to suggest that. Also, red is an aggressive color and it would be better suited to the lumbering cubes that would torment my little protagonist. I also knew that the ball would need to blush. How does a red ball blush? On the other hand, blue could easily shift to purple and even red in anger. Eventually the ball would be rendered as a three dimensional shape and the lighting would prove to be a huge can of worms. ← Pt 1: It all started with a drawing.